After several years of use, this review of Ameritron’s AL-82 amplifier seems long overdue. I have owned the AL-82 for three years now, and over that time, it has given me incredible performance on all bands. This review will not be a technical review, it will in fact be a general observation and usage review. Questions like: does the amp hold up, does the amp work, does it run hot, is it easy to tune, etc., that sort of review… All comparisons will be based on my ownership of the following amps: Heath SB-220, Heath SB-200, Drake L4B, and a Gonset GSB-201. All amps but the Gonset were wired for 220 VAC, not 110 VAC. All amps were run in desktop service. ie. not in a rack with additional cooling, just sitting on a desk. All amps were used in contest service. We need a base to compare amps with, so we will break the amps into the following. The Gonset falls into the light duty category, it uses 811A’s, and will not push a 1.5 KW signal into an antenna, The SB-200 falls into the medium duty amp, it will not push 1.5 KW to the antenna, and the SB-220, L4B, and AL-82 fall into the heavy duty category. I almost classed the 220 into Medium duty, but it will push a KW plus to the antenna so it is classed as heavy duty. The reason for the classifications is to separate the amps out so as to get an apples to apples comparison. Lets look at the Gonset first, it is small, does not even rank in the same class as the AL-82, and I would never own it again… The SB-200 is a good amp for what it does, but it is not an RTTY amp, you can’t run it full output for 10 minutes at a time, I was able to run 200 to 350 watts out of it all day in RTTY. The SB-220 on the other hand will do this all day, but I get the feeling it is not good for it, it gets really hot! No glass chimneys on the tubes, so the heat just is not carried away fast enough, I was able to run 500 to 600 watts out of it all day but it ran very hot. This leaves only the L4B, and the AL-82 to compare… If I had to pick I would take the AL-82. After use I believe it is a better amp, it runs a bit cooler than the L4B. 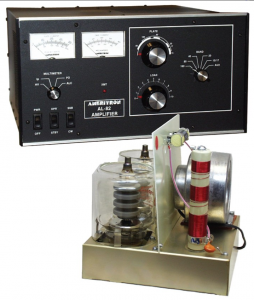 No more comparisons, let look at the AL-82 by Ameritron. Duty Cycle, what is it? OK… One more thing– we need to understand what kills amps before we understand why one amp is better than another for a given purpose. The biggest killer of amps, (once tuned, and having the operator be non stupid), is misuse of the amp as it relates to duty cycle. What is duty cycle, lets look at it below. You are running PSK– you tune your amp to 1000 watts output as read on an external watt meter, (see the review of the AWM-30 here), you begin transmitting. Your watt meter goes to 1000 Watts, and sits there for the entire transmission. That is 100% duty cycle, as viewed on a transmission by transmission basis. Now consider– you are speaking into a microphone of the same amp described above, and tuned the same, your voice is modulating the amps power output between something less than 100 percent, and 100 percent, thus the amp is not putting out one hundred percent power all the time. You are running less than 100% duty cycle. I do RTTY a lot, this is 100% duty cycle, and will test anything, from your exciter to your coax cables, to your amp. In all cases the AL-82 has held up well… I had a bad coax connector on one of my jumpers, and it would get hot, but the amp would continue to function fine. I have had a total of two issues with the amp, both related to the bandswitch, one my fault, and the other probably my fault. I tuned up on the wrong band, (exciter set to 80 meters, amp set to 20 meters), this killed the bandswitch for some reason. I would have expected to smoke an input stage coil on the amp, but the bandswitch died… In another instance, I think I had the bandswitch in between bands, and again not to my surprise, this also killed the bandswitch. I had ARS in Portland, Oregon, replace the bandswitch both times. Both times it cost me about $200 bucks. As a result I am now very careful when running the amp. Both times were my fault, and I would not expect any amp to survive that sort of abuse. Doing high power forces one to be careful. Back to duty cycle– The harder you run your amplifier the better the amp has to be constructed to survive. Survive means not burn up, blow up, or melt some internal part. Yes amps will literately melt parts! As you run the amp, things begin to heat up, so if you are running a low duty cycle type of modulation, (SSB, CW), the things inside the amp heating up have a moment to cool down… An example might be the Gonset, if I tune it to full output, and then start sending CW or SSB, there are little brief time periods in which the amp can cool down, between words in SSB, and between letters, dits and dahs, in CW transmission. These unused times when transmit power is zero, or very low, are VERY important to an amp, they make the difference between death, and survival, they allow things to cool off. It I were to run RTTY using the Gonset, at full output I doubt it would last at best 5 minutes before something smoked inside it, while I could continue a SSB communication session for days using the same amp, loaded the same way. That is what duty cycle does for you, it lets the amp cool between peaks. What heats up in an amplifier? Power transformer, tubes, just about everything get hammered during transmit. Why would you want an amp which will not deal with a 100% duty cycle, you would not, however in the real world you might not be able to afford one. 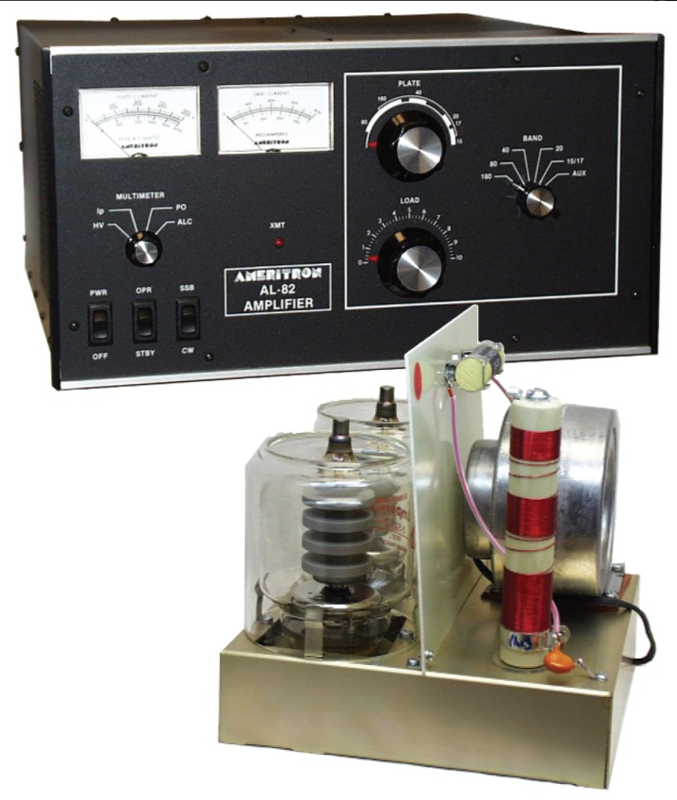 A used SB-200 will run you around $200 to $400, depending on condition and how bad you want it, and how much risk you are willing to take with a used Heathkit some guy built 40 years ago. A used AL-82 will run you around $1000.00 to $2200.00, again depending on how bad you want it. For the casual operator, who is not going to do RTTY, or PSK save your money and get an AL-811 from Ameritron. The smaller amp will do you just fine. If on the other hand you want to do digital, and you want something that will do 100% duty cycle, you need a more robust amplifier. Why spend that much money? I can’t afford an Alpha, new, or used, (a used Alpha 77 will run you $6000), nor can most hams that I know. I am not sure any amp is worth that much money, but some hams have way more money than I so they buy Alphas. I hope they enjoy the amp, and I hope it gives them decades of long term service, but an amp of that price range is simply out of my price range. I was at a local ham fair several years ago, and there was a reputable dealer there with a really, really, good price on a used AL-82. I had not intended on getting an amp, but seeing the AL-82, in a price range I might consider intrigued me. I took the amp apart and looked at it. I was instantly sold. I had been into my old Heath, and the L4B, the AL-82 look way better to me inside than the SB-220, and on par or better than the L4B. Covers 160-10 Meters, all bands. Broadbanded enough for MARS work. You should do 220 VAC to run this amp. It will kill a 15 amp breaker. One thing I really do not like about this amp is the lack of safeties for power on, and power off. The L4B had the same issue– no safeties. In fact looking back on all the amps I have owned no amp had this feature. I think the reason I want it on the AL-82 is it is such a nice, high powered amp, it really should have this feature, where all the rest of the amps I owned were not as nice with the exception of the L4B. In any case, with the AL-82, (and every other amp I have owned), it is entirely possible to have a 30 minute transmission at close to full output, heating up everything in the amp, making the tubes glow cherry red, (this is OK they are supposed to do that), and then just reach over and kill power to the amp, while you are transmitting. This leaves the amp internal parts very hot, with no real way to get rid of the heat. I suspect the internal temp of the amp would increase dramatically by doing this, I further suspect it would break the amp. Granted it is stupid to do, but sometimes people do stupid things. The cost could be as high as a new set of tubes, at a few hundred per tube. You can do the same upon power up, you can hit the AC power, then instantly start tuning, not good for the tubes, yes it is stupid, but I did leave the bandswitch in the wrong position once… Would have been nice to have a safety to stop this. I intend on building an arduino safety add on for this amp, and making the information available here late in 2014. As you can tell I like the amplifier, in fact I have gained a new respect for Ameritron, the amp has held together well, works well, has very few issues, tunes up easily, will do both 10 and 160 meters, and in general is just a wonderful addition to my stations. If I had to buy another amp, it would be an Ameritron product. They are in my opinion selling a well built, reasonably priced amp in the AL-82.